The CRM integrates with multiple accounting systems. The link between the CRM and the accounting system is the Sales Ledger which is stored on a Division record. If you have already created the Sales Ledger within your accounting system, please take a look at our Setting a Sales Ledger on a Division article. This article will focus on creating a Sales Ledger from the CRM using the information stored on the Division record. To create a Sales Ledger click within the Sales Ledger drop down located on the main details page on a Division record and select the 'Create Sales Ledger' option. You will then be asked to fill out information about the new Sales Ledger. The CRM will try to use the information available on the Division record such as Telephone, Fax and Website to avoid the user having to re-enter this information. Based On: In order to create a new Sales Ledger you will need to choose an account to use as a template. You can either choose from your configured model accounts or search for another Sales Ledger to use as a template. 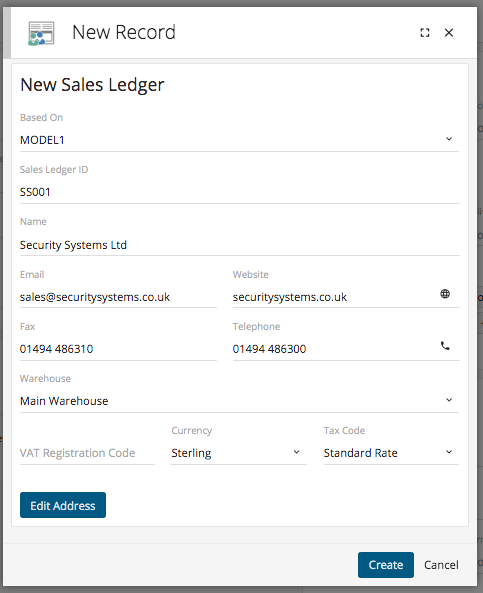 Sales ledger ID: Simply type in the Sales Ledger code that will be used within the CRM and your accounts system as a reference for your new Sales Ledger. E.g. SS001. Please note: this needs to be unique from any other Sales Ledger codes. Name: This would be the name of the Division that you're setting this new Sales Ledger for. Email: The email featured here will be the main contact's email address which will appear against the Sales Ledger. Website: This should be the website address for the Division. Again, by default this will be taken from the Division record if previously entered already. Fax & Telephone: These contact details will be taken from the Division record if previously entered already. Please enter if they were not included on the Division record. Warehouse: When this customer orders products from your business, then the products will be taken from the Warehouse selected. VAT Registration Code: Here you can enter the customer's unique code which is issued when companies are registered to pay VAT. Currency: Choose the appropriate currency that this customer will purchase in from the drop-down. Tax Code: The tax codes displayed within the drop-down will be imported from your accounts system. You will need to choose the most suitable option. 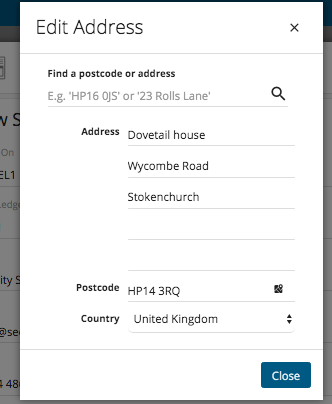 Finally, you can edit the Sales Ledger address by clicking the 'Edit Address' button. It will automatically pull through the Division address, but you can edit this if required. Once happy with your changes click 'Close'. Your new Sales Ledger will then be created and will be imported into your Accounting system once your imports have completed.